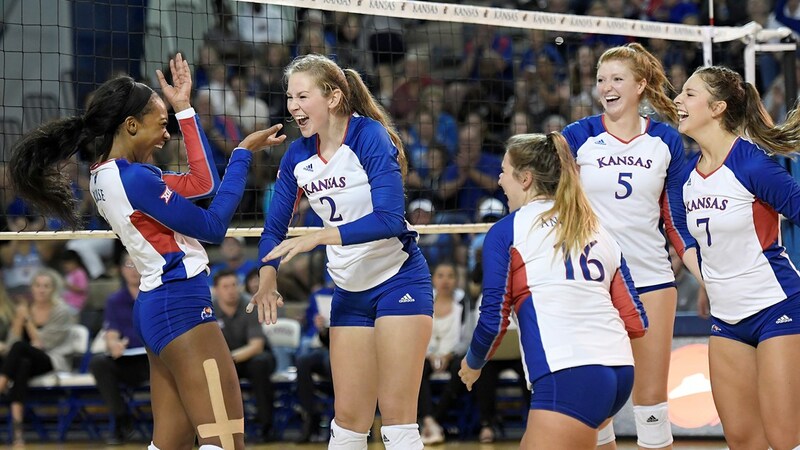 The Kansas volleyball team looks to extend a four-match winning streak during its Big 12 road opener at Oklahoma on Wednesday night at 8 p.m. Central time in Norman. The contest will be televised nationally on ESPNU with Sam Ravech calling the action and former Stanford coach John Dunning providing analysis. The Jayhawk IMG Radio Network will broadcast the action on KUAthletics.com/radio and Lawrence’s KLWN-AM 1320. Kansas enters its Big 12 road opener with an 8-4 record overall and 1-0 record during Big 12 play as winners of four-straight matches. Oklahoma has a 9-5 record overall and a 1-1 record during Big 12 play under first-year head coach Lindsey Gray-Walton. Kansas and Oklahoma meet for the 88th time on Wednesday night in Norman. The Jayhawks have won the last seven matches in the series, while the Sooners lead the all-time series, 48-39. Since the inception of the Big 12 in 1996, KU is 30-14 against OU, including a 28-10 mark under head coach Ray Bechard. The series dates back to 1976. Junior middle blocker Zoe Hill earned Big 12 Defensive Player of the Week honors on Monday after leading the league in blocks per set during the first week of Big 12 play. Kansas has a 6-16 all-time record in Big 12 road openers, including a 4-2 mark since 2012. Wednesday will be the sixth time KU has played its first road match of the Big 12 season at Oklahoma; the Jayhawks are 1-4 against OU in Big 12 road openers. The Jayhawks are coming off their fourth-straight Big 12-opening victory, defeating TCU in four sets on Saturday in Lawrence. Kansas is in the midst of an 11-match stretch in its schedule that features 10 home contests. Wednesday will be KU’s second of two road matches during the month of September. KU features one of the best defenses in the conference, leading the Big 12 in blocks per set (2.84) and ranking second in opponent hitting percentage (.159). The Jayhawks have used 10 different starting lineups through 12 matches this season. Kansas has played five five-set matches with a 3-2 record this season. This is KU’s 43rd season of intercollegiate volleyball and 21st under head coach Ray Bechard. In his time with the Crimson and Blue, Bechard has compiled a 382-244 (.610) record and guided Kansas to all of its nine NCAA Tournament appearances. Bechard is the winningest coach in program history. Last season, Kansas posted a 22-8 overall record and an 11-5 record during Big 12 play to earn a sixth-straight berth in the NCAA Tournament. KU has finished each of the last six seasons with at least a top-20 RPI ranking (No. 20 in 2017). The 2018 season is the 20th and final season of KU’s home court — Horejsi Family Athletics Center. The facility will be torn down and rebuilt as the new Horejsi Family Volleyball Arena after the season. For the third-consecutive season, season tickets for KU’s home matches at Horejsi Family Athletics Center are sold out. Junior outside hitter Jada Burse leads Kansas in total points (160.0), averaging 2.96 kills per set and 0.57 blocks per set this season. Coming off a career-high 23 kills against TCU on Saturday, Burse has reached double-figure kills in nine of the last 10 matches. Junior outside hitter Ashley Smith has nearly-identical numbers as Burse, averaging career-bests of 2.74 kills per set and 0.46 blocks per set this season. Freshman Camryn Ennis has started the last nine matches as KU’s setter, averaging team-bests of 6.59 assists per set and 0.20 aces per set. The San Antonio native has reached seven assist-dig double-doubles in her 10 matches played as a Jayhawk. Reigning Big 12 Defensive Player of the Week Zoe Hill leads KU’s presence at the net with 1.36 blocks per set, which ranks second in the Big 12 and 28th nationally. Offensively, Hill averages 2.19 kills per set on a .318 hitting percentage. Junior Allie Nelson and freshman Lacey Angello have split time as KU’s starting libero with six starts each in the off-color jersey. Angello leads KU in digs per set (3.18) with Nelson not far behind at 2.82 digs per set. Nelson has served a team-best six scoring runs of 5-0 or longer this season; Nelson’s longest scoring run as a server was a 7-0 run in the first set against UNCG (Sept. 14). KU’s longest scoring run of the season was 8-0, served by Ennis, to end a fifth-set victory over College of Charleston (Aug. 31). Freshman middle blocker Rachel Langs has started the last four matches and is coming off a season high of 11.5 points against TCU on Saturday, recording eight kills on a .375 hitting percentage with five blocks. Junior outside hitter Patricia Montero will undergo season-ending surgery to mend an injury incurred on Aug. 31 against Dayton. Montero, a six-rotation player, led the Jayhawks in kills per set (3.62) and points per set (4.04) at the time of her injury. Jada Burse recorded a career-high 23 kills to lead Kansas to a Big 12-opening victory over TCU on Sept. 22 in Lawrence, 3-1 (28-30, 27-25, 25-21, 25-23). The Jayhawks extended their winning streak to four matches after capturing a Big 12-opening victory for the fourth-consecutive season. Burse recorded her 23rd and final kill on match point. Junior outside hitter Ashley Smith recorded 13 kills. Rachel Langs and Zoe Hill contributed eight kills each. Camryn Ennis matched her season high in assists (39). Allie Nelson anchored the back row with 23 digs. The Jayhawks held the Horned Frogs to a .113 hitting efficiency with 16.0 team blocks, led by Hill’s nine block-assists and seven from Gabby Simpson. KU returns home for three-straight Big 12 home matches at Horejsi Family Athletics Center, starting with West Virginia on Wednesday, Oct. 3.